Click for larger This item is temporarily unavailable because we can no longer get the heavy buckles needed to make it properly. We will have a new version made of 1 1/2" webbing on the site ASAP. Shown here close up, in place, and in use, the three piece bed bonds give you the ability to spread-eagle, with the additional center strap to connect whatever you like. Made of heavy cotton webbing, with steel "D" rings and buckle. The three piece set is portable, and lightweight. We make this in two versions, the first will fit all bed sizes from twin to king. The version here is the standard, shown on a twin bed. The second will fit only king and queen. 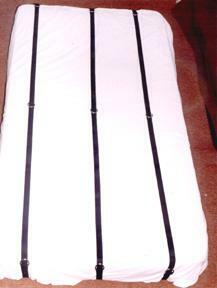 The difference is that the second set will place the "D" rings closer to the head and foot on the larger mattresses. It will, however, overlap, if you attempt to put it on a twin or full.